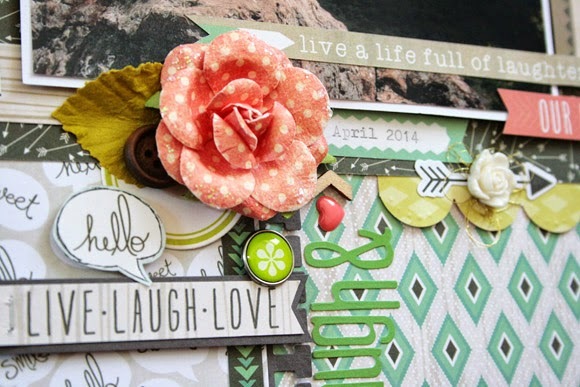 Hi lovely blog friends, sharing another just for fun layout today. 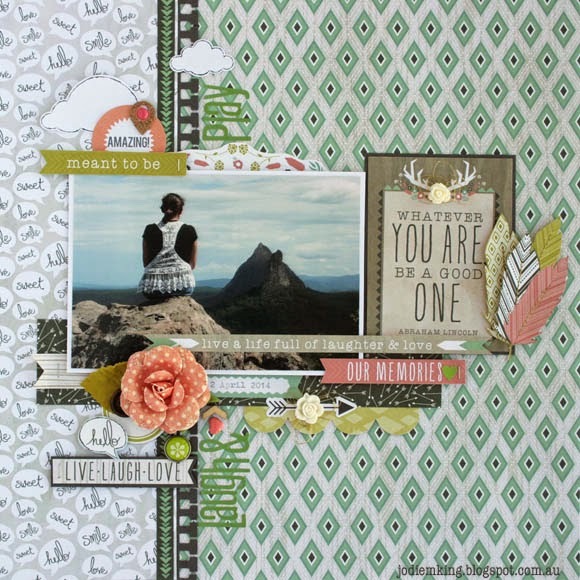 It's my second layout using the Kaisercraft Bow & Arrow collection. 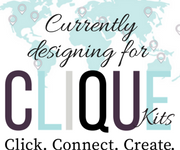 You can see my first layout over on this blog post. The photo for this layout was taken from the top of one of the Glasshouse Mountains. Greg, Kayci and I had hiked up Mt Ngungun (erm.. its definitely one of the smallest in the group of mountains thank goodness). The view from the top is stunning, you can see from the north of the Sunshine Coast out to the ocean, there's amazing views of the other Glasshouse Mountains and you can even see the Brisbane city skyline in the distance. 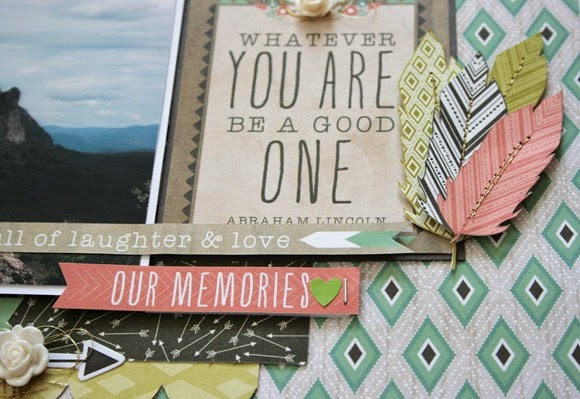 Most of the elements on this layout come from the patterned papers in the Bow & Arrow collection, but I have added a few bits & pieces from my stash. I've pulled out my gold thread again, love it so much and keep going back to it. Kaisercraft is among the papercraft companies that add extra printed elements to the title strip at the bottom of their patterned papers. I'll often find myself adding these little bonus pieces to a layout. 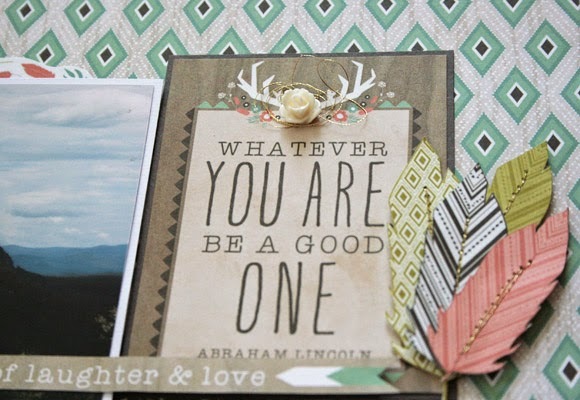 The quote strip "Live a life full of Laugher & Love" is one of these, and the deep brown strip with green chevrons running vertically behind my photo is another. The apricot flower is from the Prima Princess range. Love the dusting of glass glitter on these. 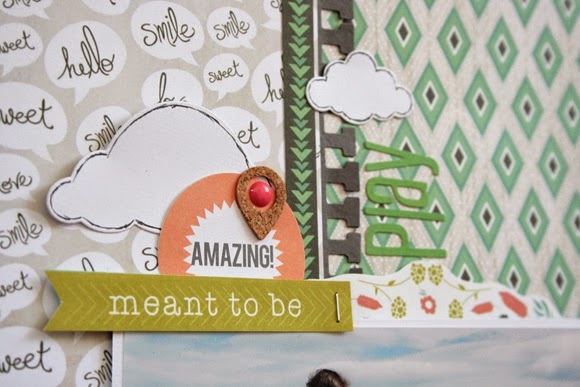 The brad is from Simple Stories and the sweet enamel dot heart is from We R Memory Keepers. I've die cut a couple of clouds in white cardstock and run a black pen around the edge to define them. The elk's antlers are adorable by themselves, but I've layered some wound gold thread and a resin flower to add a little extra. This Abraham Lincoln quote on one of the 3x4" cards is a little twist on a life lesson that my parents always instilled in me when I was younger, that if something is worth doing, it's worth doing well. I thought it fit well with the contemplative vibe of the photo.